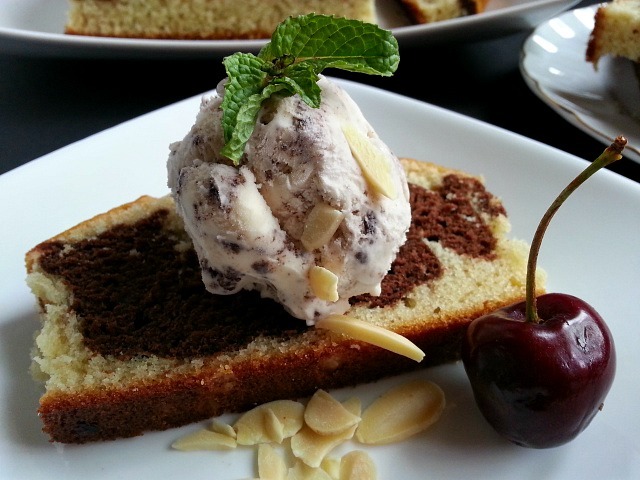 Marble Cake is very much part of the Goan culture. In-fact in the 80’s stores would mostly sell 4 types of cakes in Goa Pound, Plum, Marble and Rainbow cake. During Christmas we would get Walnut and Fruit Cake. The batter was a basic pound/sponge cake with different twist. In mid 90’s coffee and pastry shops were getting popular and these cakes started to lose their charm to newer pastries. This cake does brings back fond memories. Tea time after siesta is very much the “Susegado(peaceful)” Goan lifestyle that is slowly dying. Family or friends usually drop by to visit between 10-12pm or 3-6pm and that is when either tea or soda will be served along with snacks. Please note: If you are a professional baker than my measures may not seem right. I like my cakes to be less sweet and low-fat 🙂 . If you skip the cocoa powder than you can use the same batter to make the famous Victoria Sponge Cake Recipe. A very easy to make basic moist sponge cake. Grease and flour a bread loaf pan. 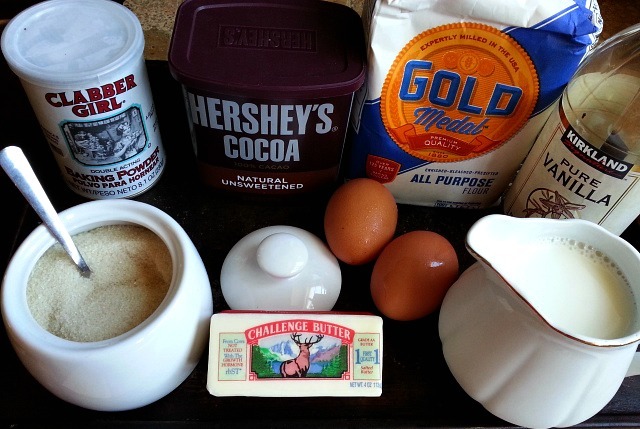 In a mixing bowl, mix together butter, sugar, eggs, vanilla essence, baking soda till all the mixture is smooth. Next add the milk and mix well. Add the sieved flour slowly and keep mixing with your hand mixer till smooth. Divide the batter into 3 equal portions and add the cocoa powder to one portion. Pour in the vanilla batter first then slowly add the chocolate and top it again with the vanilla batter. Use a knife and swirl it around through the batter. Bake for 20-30 minutes. Till a toothpick comes out clean. Let cool in the pan for 10 minutes take it out and then cool it on a cooling rack. 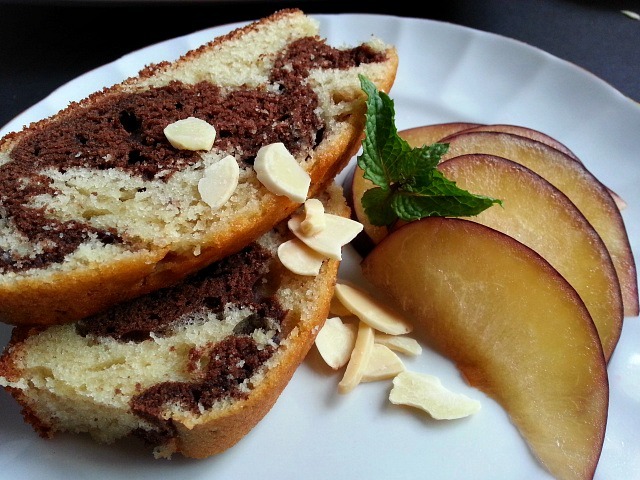 Enjoy the moist Marble Cake with a nice cup of afternoon tea like a true Goan. This looks amazing! I am hoping to try it out. Thanks for stopping by my blog and taking the time to check it out. I will stop by your again to look for more goodies! Thank You so much and Thanks as well for stopping by 🙂 Happy New Years! Your blog is so scrumptious Nandini I want to eat it all ;D Really loving my stay here. Your cooking and your recipes are really wonderful. Lol …. Thanks Lala. That is very kind of you to say. Thank you for liking my poem, and it’s a pleasure to visit your blog! I loved this Marble cake, as this is my area! I make very rich cakes and I enjoy trying to master icing them. This looks sooo yummy! 🙂 Also,thanks for visiting my blog. I’m going to try this with cashew milk, instead of cow milk!! Looking forward to some yummy cake this weekend. That sounds to be equally delicious Ms McKahsum. Let me know how it turned out 🙂 . When I visit your blog it brings back happy memories of Goa! You have an awesome blog!That is why I have nominated you for the Dragon’s loyalty award. Please find all the details here-https://indfused.wordpress.com/2015/07/29/3-awards-in-july/ Congratulations! You are welcome, Nandini! You deserve it and so much more! Wishing you a fabulous weekend too, Nandini! I always asked for marble cake for my birthday when I was growing up. Your version looks delicious and brings back memories. This cake is also popular in my culture. Growing up, marble cake, sponge cake and honey cake were staples at kiddush on the sabbath. I have yet to make one successfully. Thank you for the recipe! I will try. you might think it funny but I am nervous! It is my sister in law’s favorite and tonight is her birthday. Beautiful cake, I didn’t realize that the marble cake was popular in Goa. Great with a cuppa for sure. What a beautiful cake Nandini! This looks so good! Would be great with coffee 🙂 I like my cakes to be less-sweet, as well! I was just trying to decide what kind of dessert to make for the week and I think I will definitely make this cake! Thanks! I’ll definitly try it! You have a great week too! Archived ! Thanks for sharing. I love marble cake ! 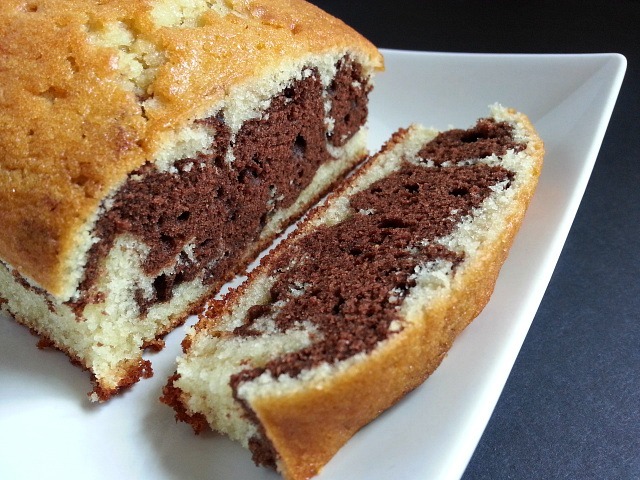 This post makes me want some marble cake! This is one delicious cake..yumm.. Thanks for your wishes and inspiration. I too have nominated you for the Dragon’s Loyalty Award. Thanks. You have a great weekend, too. This cake looks great. Very nice! This sounds terrific! Can’t wait to try the recipe. It’s only Me.Your MARBLE CAKE looks REMARKABLE. My spouse likes baking cakes, all sorts of cakes. I particularly like Her FRUITCAKE. Of late She has got into baking Her own bread. She can’t stop talking about why Her bread is better than bread bought from the British supermarkets. I got a new name for Her, MRS PODERINE. She tries to explain to Me that the commercially available bread contains a lot of chemicals. Now Your MARBLE CAKE I think will be next in line for the OVEN TRAY. You mentioned the word SIESTA. I recall Me late mum and dad liked their siesta. I think it is the heat which prompts Goans in Goa to do that. All hot countries take a break at miday and have a nap. Countries like Portugal,Spain and Italy love their SIESTA. Yesterday it rained cats and dogs in Surrey UK. Today is relatively a better day with Sunshine. But for how long is anybody’s guess. And finally Nandini, thanks for sharing Your culinary expertise with Us. At this I will pull the plug. Thank You very much Mr Stan for you always encouraging words. I will do my best to create an awareness of Goan cuisine. Mrs Stan is right, breads at the grocery store do have a lot of preservatives. I tried my hands at baking my own bread for the same reasons. But I still haven’t mastered the art of it as yet. We too had mucky and cloudy weather last 2 weeks out here but today the shine is shinning bright which I love being a Goan 🙂 . You both take care and have a great weekend. Hi Nandini! Just wanted to let you know how informative I find your blog. And that I nominated you for a Premio Dardos Award. This looks yummy! I think I could make this for the family. Yes Cynthia me too 🙂 . Miss my days in Goa. It looks gorgeous and soooo delicious… I will try it. Blessings!